Powerpole Kit PP45 (100 Red/100 Black Housings, 200 Contacts) - AndyMark Inc. This is a kit of loose Anderson Power Products (APP) Powerpole (model PP45) connector hardware, aimed at providing a robot builder some tools to make dis-connectable cables and wires. This kit contains 100 Red Housings, 100 Black Housings and 200 Contacts. This kit provides the connecting hardware needed to make 100 Ground/12V pairs that are easily removable. Overall weight - 0.88 lbs. What's more to say - a genderless connector which can be combined into a keyed connector if desired. The operating contact faces are NOT the initial contact faces, reducing oxidation at the interface. Finally, that spring retention (as opposed to friction retention) is wonderful. And if so many ham radio mobile and DX stations depend on it, you know it's reliable. Every time we order, our things arrive incredibly quick, well packaged. Very easy to work with! 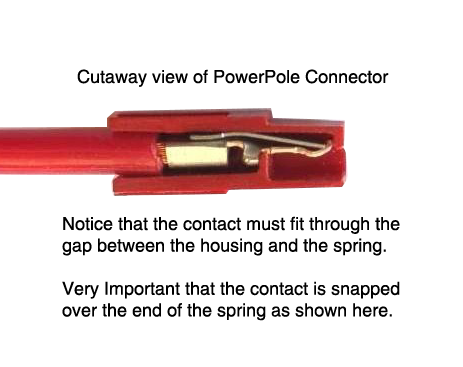 These are very strong connectors and work very good for FTC. Thank you again for the speedy service!